You may never have heard of the shy five and the chances are you may never encounter them. They are not called shy for nothing. The Karoo is not a big safari destination but it does boast some intriguing but hard to view wildlife. For those with the patience and the time the shy five are an alternative game-viewing experience to the well-known big five. They are the meerkat, the aardvark, the porcupine, the aardwolf and the bat-eared fox. All are nocturnal except for the meerkat and all are notoriously difficult to spot in the wild. The meerkat magic project in Oudtshoorn gives you the chance to at least view the one member of the shy five that shares our daily routine. The tour is the brainchild of Devey Glinister who has worked tirelessly to earn the trust of a meerkat family living on farmland just outside the town. For 364 days a year (he takes a break on Christmas Day) he sits patiently at the entrance of the meerkats burrow to the point where they have accepted him as just another part of the landscape. His tour starts before sunrise as you join him for coffee and then a short walk to the entrance to the underground burrow of the family. Overnight the meerkats sleep deep below ground. Devey knows this because he once dropped his cellphone in an old burrow and had to dig down three metres to retrieve it. As the sun emerges over the horizon so do the meerkats. First, the dominant male rises and confirms that no predators are in the vicinity. Shortly he is joined by the whole family who must stand facing the sun and warm themselves before a busy day of foraging. There is a short spell of fighting as the daily pecking order is arranged among the group but it quickly settles down. This allows guests the chance to sit and observe the whole group emerge and begin their daily ritual before following the meerkats at a distance as they begin their morning search for food. It is a unique experience. You are faced with a family group of wild meerkats that are completely habituated to human presence yet behaving exactly as any group would in the wilderness of the Karoo or Kalahari. Devey and his project partner have been careful to not feed the animals or leave scraps behind they could scavenge. The habituation has been achieved simply by sitting with them for long periods of time – in the cold mornings and the heat of the scorching summer and even in the rainy days of winter. When they are ready the meerkats dart off into the scrubland with their bouncing tails, the only way to tell which direction they are heading. 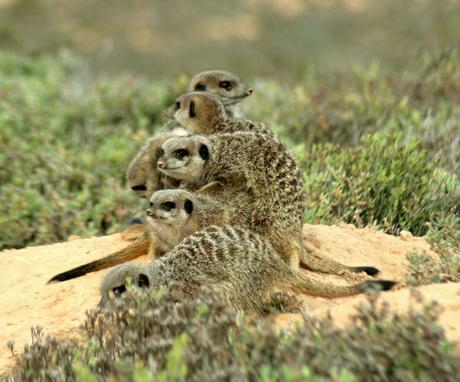 You will need field glasses to follow them on their foraging but for the first 30-60 minutes of the morning you can simply relax on a fold up chair and watch as the meerkats greet the day just a few metres from your feet. It is all over in time to return to your guest house for a late breakfast. 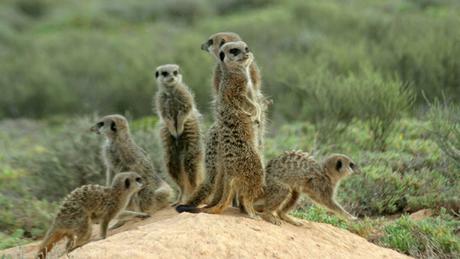 If you are lucky you may have spotted some of the bucks and birds of prey that the meerkats share their day with. If you are really lucky you may one day get to see the rest of the shy five. For that you will need a torch and good night vision. Only the meerkats brave the heat of the Karoo day and while you head back for breakfast they have the landscape all to themselves.